Well it’s the middle of the mountain bike season now and for many of us we have been on the trails for about 4 months already. The riding has been great this year and I’m sure many of you have been riding hard. Hopefully everyone has remained injury free and pain free (Except Ken of course….who is now thankfully on the mend). If not – here is some information on one of the most common problems/pain that I see in my clinic as a result of mountain biking. Neck pain can be exacerbated by several factors including: riding position, technique, and other pre-existing conditions. In the cycling position, the neck is extended and the back flexed for prolonged periods. Riding for long periods of time, increases the load on the arms and shoulders as well as hyperextension of the neck, leading to muscle fatigue and pain. If the virtual top tube length (top tube plus stem length) is too long for the rider, hyperextension of the neck is further increased. Prolonged hyperextension of the neck and associated muscle strain may lead to trigger points in the muscles of the neck and upper back (especially the upper trapezius muscles). Trigger points are small rubbery knots that form in muscle and adjacent muscle sheaths (fascia), which send pain signals to the brain and contribute to a pain-spasm-pain cycle. Trigger points are frequently caused by direct blunt trauma, or by repetitive micro trauma, as is seen in overuse athletic injuries. Additionally, cyclists (especially older riders), may present with referred or radicular symptoms down the arms or in the hands. This may be due to a certain degree of arthritis in the cervical spine. Similarly the facet joints of the neck may become aggravated due to prolonged hyperextension. Riders suffering from neck pain should consider the fit of their bicycle. One way to reduce neck hyperextension is by raising the handlebars or using a more upright stem/handlebar combination or perhaps even by using a shorter stem. Moving the saddle forward also reduces virtual top tube length, but the rider should be cautious as improper fore/aft saddle position can lead to knee pain. Changes to riding technique can also help with neck pain. A rigid riding position transmits more shock directly to the neck and shoulders. Riding with unlocked elbows and more dynamic leg and arm absorption can alter neck posture minimizing pain. Full suspension can help out as well. The benefits of stretching are well documented by research. Therefore it would make sense to frequently stretch your neck during the more leisurely parts of the ride as well as directly after your ride to reduce the frequency and severity of neck pain. Low back pain is also very common in mountain biking. Riding position leads to prolonged back flexion, resulting in muscle pain in the unconditioned back. The low back is the primary muscle group generating power and controlling the movement of the bike. If the back is not well conditioned and flexible, muscle fatigue and strain will occur, leading to pain. The virtual top tube length and the amount of spinal flexion in the riders back should be considered in cyclists with back pain. If the handlebars are too low, the flexion (lordosis) of the spine is exaggerated resulting in increased pressure on the lumbar spine. If the top tube length is too short, the sacral spine will flex, increasing pressure on the intervertebral disks. Ensuring that the handlebar height and top tube length are correct should help minimize back pain. Pelvic position also contributes to back pain, as a misaligned pelvis will cause strain to the back musculature. Tight quadriceps will tend to tilt the pelvis forward, while tight hamstrings predispose to backward pelvic tilt. Pushing large gears or extended hill climbing may fatigue the gluteus muscles and the hamstring muscles, causing the pelvis to tilt backwards, aggravating the back musculature, causing pain. Also, the strength of the core abdominal muscles is critical to maintaining stable pelvic positioning. Core muscle group strengthening and lower extremity stretching will help with proper pelvic positioning and lead to pedaling efficiency. 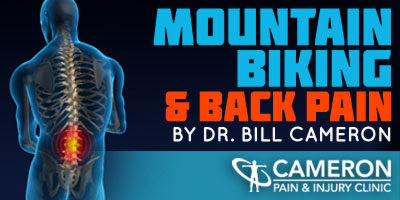 Other lower back structures such as the disc, the sacroiliac joints, and the various spinal ligaments can also be stressed/injured and cause pain as a result of mountain biking. The only way to accurately find out were your pain is coming from is to have a qualified professional assess your spine. Because mountain biking demands prolonged back flexion and neck extension, ensuring that your neck and back are flexible is very important. The movements and action involved in Mountain biking demands repetitive hip and leg flexion anchored by a stable pelvis. Core strength and stability should be something that all riders (regardless of level) should try to improve. A good manual or physical therapist can easily teach common back and neck stretches and back core-strengthening exercises. Neck and back pain is a common complaint among cyclists. By making a few select adjustments to the bicycle fit and committing to a core strengthening and stretching program, this ailment can be easily remedied. If symptoms persist please feel free to give me a call for a consultation. This kind of post is always inspiring and I prefer to read quality content so I'm happy to find many good points here in your post. Writing is simply great! Thank you for the post. I like the helpful information you provide for your articles. I’ll bookmark your weblog and check again here frequently. I am quite sure I’ll learn many new stuff proper here! Best of luck for the following! Thanks for providing such a useful information. I will be careful with exercises and postures while riding next time. How I got the name... "Gorilla on a bike" Have you heard of the golden touch? Well, I have the gorilla touch. Weighing in at 250+ I tend to be hard on bike components. I have busted bottom brackets, free hubs, and even crank shafts in half. If you can name it, I've busted it. Plus for the past four years I have cracked my bike frame every season, twice in 2009. Thus, the club started to lovingly call me the "Gorilla On A Bike". 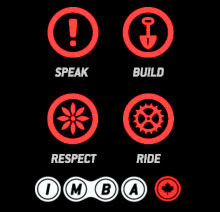 Cancel that $#!% Mountain Biking Club out of Midland Ontario Canada. CTS was started in 2006 between a group of 6 riders that loved to ride Tuesday nights in Crownland Forest. So much so, that they would cancel anything to ride. We continue to grow every year. CTS club is casual, there are no dues or fees, it's really a bunch of MTB enthusiasts. The CTS mountain bike club does not warrant that the trails we ride are safe. We make no indication as to whether or not the lands that these trails occupy is private or public, and the CTS bike club bears no responsibility in this regard. Please note that mountain biking is inherently dangerous and without limiting the generality of the foregoing, you may encounter unexpected traffic, poor weather, low or no trail maintenance or difficult terrain. Please use common sense and caution when riding. The CTS bike club bears no responsibility in the event of injury or death. Therefor, by riding with the CTS bike club "I Agree to this Disclaimer."